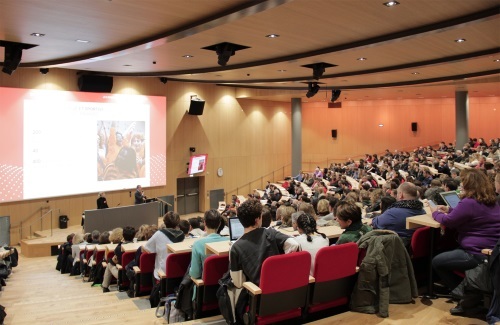 Audiolead and Videlio equip new Grand Auditorium at French university with 5.1 surround system for conferences, presentations, live music and movies. Institut d’Etudes Politiques de Paris (often referred to as Sciences Po) is a French university with seven campuses across the country. The new Grand Auditorium at its Reims site has been equipped with an audio system featuring Alcons Audio. Founded in 1872, Sciences Po quickly became an influential academic institution for the social sciences. Currently it has 13000 students based at its seven centers throughout France. The Reims campus opened in 2010, with just 100 students, but a recently-completed €75m expansion has meant it will be ready to accept 1600 students in September 2019. A major part of the project is the new 650-seat, multi-function Grand Auditorium, which hosts conferences, lectures, presentations by guest speakers, live music and movies in 5.1 surround sound. Alcons is no stranger to equipping multi-function rooms, where a combination of sound reinforcement and dedicated cinema pro-ribbon systems can successfully address the specific needs of both applications, despite them technically being very different. Bruno adds that Sciences Po technical manager Vincent Watel is more than satisfied with the system, saying that everyone who uses the auditorium has been impressed by the coverage, natural sound quality and complete lack of distortion. Even at high volume levels, the sound is exceptionally clear and there is no feedback from either gooseneck or musicians’ microphones. “Sciences Po is an example of an installation where it is important to address the technical disparities between the uses of a system,” says Alcons co-founder Tom Back. “For example there are differences in the frequencies at which the subs should take over, whether there is any overlap between them and the main array modules and, of course, whether the screen is in use or not.